The UK's Kerrang! magazine has celebrated the careers of four huge rock acts at their 2008 awards ceremony. 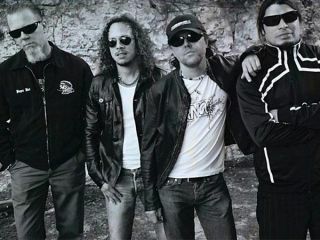 Special awards to went to Metallica, Rage Against The Machine, Def Leppard and Slipknot. James Hetfield, Lars Ulrich and co collected the trophy for the Kerrang! Inspiration award, marking Metallica's inimitable influence on modern metal. Rage Against The Machine turned up to be inducted into Kerrang! 's Hall Of Fame, joining the likes of Judas Priest, Slayer, Iron Maiden and Metallica. Def Leppard were given the gong for Classic Songwriter, while Slipknot received the Icon award. Bridgend metallers Bullet For My Valentine carried on a remarkable tradition by being the fifth Welsh band in 10 years to win Best British Band. In 2006 and 2007 this was won by Lostprophets, in 2005 Funeral For A Friend, 2003 Feeder, and 1999 and 2000 Stereophonics.